Glow Wave Wave this flexible wand at night to create spellbinding streams of bright, neon light or fast- or slow-flashing meteoric bursts of color (colors vary - we will choose for you). 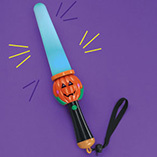 A great way to find your kids at night events, the bewitching wand includes a safety rubber tip and takes 2 AA batteries, not included. For ages 5 and up. Frightful Flashlight This flashlight's a scream! A perfect means for setting the scene on Halloween, its bright beam is a welcome safety feature unless, of course, you push the buttons that trigger ghastly, ear-splitting groans, moans, bells, cackles, screams, howls, and other loud, monstrously scary audio effects, for then the light will splutter - bubble like a cauldron or waver and die as a blood-curdling howl subsides. Takes 3 AA batteries, not included. For ages 3 and up. Fright Light Flashlight Frighten your friends with this spooky light  featuring chilling sound effects and an interactive light show. 8 built-in sound effects  from a witch's cackle to a ghost's moanInteractive light responds to chosen sound effectMultiple colored filters increase the fright factor: Mystical Blue, Blood Red, Creepy Yellow and Eerie GreenCan also be used as a normal flashlight45-day manufacturer's warrantyShine it on the walls, ceiling and even your friends for a truly frightening, good time. Halloween Flashing Necklace Set Add spooky style to any "ghoul's night out!" Halloween Flashing Necklace Set includes one with flashing pumpkin heads and one with flickering ghosts. Controller offers 3 different blinking patterns: Constant on; all flashing; or alternate flashing. 17" long. Includes extra set of button batteries. HALLOWEEN REFLECTORS These large reflectors are just the thing for young trick or treaters. Play it safe and get some for your kids. 30" cord with 5" Wide pumpkin & 3" reflector. Trick or Treat Glow Badges 6pks/4 A great addition to costumes! These plastic badges contain non-toxic glow chemicals and make a bright accent to any costume. Pkg of 4. Finger Flashlights Let your hand be the flashlight. Each in our set of four ultra-bright LED lights (red, white, green, blue) fits on a finger, so you can create swirls and whirls of exciting color with just a flick of your fingers, and also safely light your way on Halloween (uses AG3 button cell batteries, included). Spectacular and sensible for ages 6 and up. Rainbow Night Sabers Color-changing safety light adds magical fun on Halloween night-lighting the pathway for trick-or-treaters. Each changes a rainbow of seven bright colors and features adjustable wristband for hands-free carrying. Includes two AA batteries. Assorted Halloween designs; we'll choose. Plastic. 12 1/2" long. Halloween Glow Necklace Your guests will love wearing their cool glow in the dark plastic necklaces. Two toned orange and purple. Batman Begins Flashlight Be safe in your neighborhood with this trick or treat safety light. Turn off the lights and shine the flash light onto a wall or other surface, and the famous Bat Signal will appear! Also includes 2 bonus batarangs! Remember to pick up some of the other great Batman accessories like the utility belt and grappling hook. 8" Glow Bracelet Pink Keep on glowing. This pink 8" glow bracelet will glow for up to 6 hours. Match this bracelet up with our pink glow necklace (sold separately). Caution: not recommended for children under 3 years of age. Pedestrian Turn Signals BEST SELLER! We proudly present the Pedestrian Turn Signals, being safe has never been so much fun!! Pedestrian Turn Signals have snug, thin wires that fit around your earlobe. Use the attached remote to choose which ear you want to light up, or light up both to show your braking!! 20" Glow Necklace Green Shine bright even at night! Includes one 20" green glow necklace. Caution: not for children under 3 years old. Also look for matching glow bracelets (sold separately). 20" Glow Necklace Pink Keep your party glowing! This pink 20" glow necklace will glow up to 6 hours. It is a great accessory for any party or just for fun. Caution: not recommended for children under 3 years. 20" Glow Necklace Blue Light up your party! The package includes one 20" blue glow necklace. Caution: not for children under 3 years old. Also look for matching blue glow bracelets (sold separately). 8" Glow Bracelet Blue A way to brighten up any party! The package includes one 8" blue glow bracelet. Caution: not for children under 3 years old. Also look for our matching blue glow necklaces (sold separately). Trick or Treat Glow Badge A great addition to costumes! These plastic badges contain non-toxic glow chemicals and make a bright accent to any costume. Pkg of 4. 8" Glow Bracelet Green The perfect accessory to brighten up your day or night! This product includes one 8" green glow bracelet. Caution: not for children under 3 years old. Also look for the matching 20" glow necklace (sold separately).